Excel VBA Macros - What is a VBA Macro in Excel? How to set up macros in VBA? What are VBA Macros in Excel? VBA Macros use the Visual Basic Application in Excel to create custom user-generated functions and speed up manual tasks by creating automated processes. 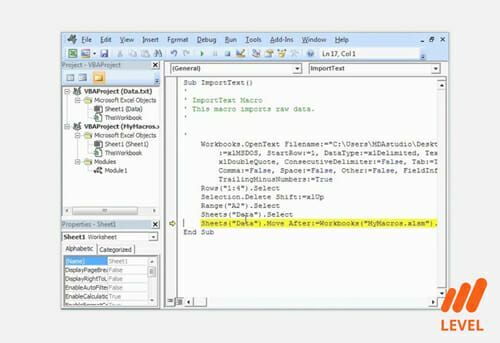 Additionally, VBA can be used access the Windows Application Programming Interface (API). One of its main uses is to change and customize the user interface by creating personalized toolbars, menus, dialog boxes, and forms. To learn more, launch CFI’s Excel VBA course now! In a separate article, CFI discusses what VBA isExcel VBAVBA stands for Visual Basic for Applications. Excel VBA is Microsoft’s programming language for Excel and all the other Microsoft Office programs, like Word and PowerPoint. The Office suite programs all share a common programming language. and how to access the VBA Editor. As a summary, pressing Alt + F11 in Excel opens up the VBA window, and allows the user to begin coding macros. To start coding, the user will have to create a Module file. Module files contain a group of macros. To create a new module, press Insert > Module. Optionally, the user can name this module using the properties window in the bottom left corner of the editor. Simply type in a new module name and press enter. To start off, the macro must be given a unique name. This name cannot match other macros, and it usually cannot match the name of other properties, functions, and tools within Excel. The macro name is what the user will use to call the macro into action. 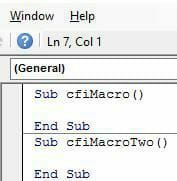 To define a macro name, the user must type Sub name() and press “enter” in the coding window of the editor. Pressing enter will automatically fill the window with the general format of an Excel macro. For example, to name the macro “CFI Macro”, a user should type “Sub cfiMacro()” and press enter. The VBA Editor will automatically add an “End Sub” line a few lines below the “Sub”. Note: The general convention for typing names for any macro, function, or variable in VBA is to use lower case if there is only one word, and to use an uppercase letter at the start of every new word. VBA names generally cannot contain spaces. Since CFI Macro is two words, this should be written as cfiMacro. However, these are just best practice guidelines and need not necessarily be adhered to. The Sub Name() line tells the editor the start of the macro code. The End Sub denotes the end. If the user wanted to, he or she could create a second new macro by starting a new Sub Name() line below the first End Sub. Try this out and you should notice that Excel will automatically create a line between the two different macros. This is the basic structure of an Excel macro. The next step, before jumping into the actual process coding, is to define the variables the user is going to use in the code. You may be interested in our fully fledged Excel VBA macro course. Click here to launch the course now!